The coefficient of the golden section indicates harmony. He "tunes" the surrounding nature and stabilizes the structure of the world around us. Fibonacci numbers are a universal tool - a mathematical language for describing processes in nature. That is, based on these numbers, you can devise a technique for analyzing and evaluating low-level processes and actions. If we talk about the international currency market, the Fibonacci numbers are very important, there are many ways to use them. 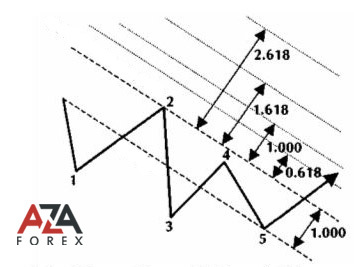 For example, Fibonacci channels: they are a highly effective tool for trading on Forex. The main task is to learn the correct construction and application. The market is a living mechanism, which means that it must also be harmonious and function correctly, showing on the chart the familiar figures that a trader can easily recognize. The Fibonacci channel is a Fibonacci grid tool. Such an extension (grid) is stretched from above the equidistant channel. And, consequently, it is possible to establish trend movements and corrections, denoting probable levels. The channel is easy to build, using a trading platform. To do this, look for the "Insert" menu, then go to the "Channels" option and select the "Fibonacci" tab. For the channel to be properly constructed, we need to take three anchor points. After that, in the left window of the menu, select "Fibonacci Channel" and click on the "Enable" function: all the components selected by us can be seen in the right window. How is it expedient to use such a channel in trading? The first and most basic is the construction at the beginning of a trend with the aim of marking out potentially possible lines - levels of support or resistance. The channel is based on a classical equidistant channel. In order to successfully create the Fibonacci channel we need, we need to have 3 points-the snapping vertices, which also act as the beginning of a new movement. When creating, we use three extremum points. If the trend is up, then the first vertex will be a sharp moment of motion, and the second point will check the resistance level, testing it. In order for the figure to be successfully constructed, the third extremum is formed higher than the first point. Having dealt with the peaks (extremums), we can build a channel by candles using the body of a candle. In the role of the boundaries of the channels are possible levels of support and resistance. Sometimes, the price can break through the channels and go right through, but as a rule, it consolidates or makes a turn, near the border of the channel. This characteristic feature can be used advantageously. When we make an entry according to the trend, as a rule, we wait for a favorable price, but this is complicated with the calculation of the end of correction. Having constructed the channel, we can refer to the expansion areas, making the move to the market, when any of the levels touch. Also, the channels are used to recognize the spreads. The turn is successfully determined by the construction of a 3-section channel. To do this, you can form a normal Fibonacci channel, then go into the object, its characteristics, select "Fibonacci levels" and delete all levels that are present at the current time. A minus sign in the levels indicates that they are located within the boundaries of the new channel that was built. This method of construction clearly demonstrates the movement of the trend and provides an opportunity to recognize the reversals. A certain signal to action is the price exit for the channel area. After that, at the cost of creating new extremes (their two). As a result, we have three anchoring points: the minimum of the previous downward trend and two new vertices (extremum points). To make a purchase is best after creating the third peak, focusing on going beyond the marked channel and further creating new points - extremums. Instruments such as Fibonacci channels are an ideal option for applying them in graphical analysis. They are relatively easy to use and provide an opportunity to quickly recognize the boundaries of the trend movement. Using them, you can successfully determine the turns, and also use graphic models in combination with other methods.